What Is the Load Weight Limit for Metal Studs? 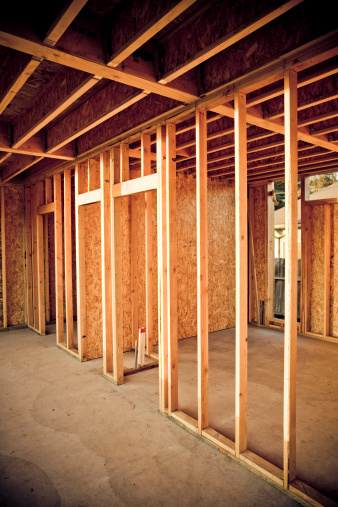 Metal studs provide the same basic support for the structure of a building that wooden studs provide. The studs support the exterior and interior walls, the ceiling and the roof. Like wooden studs, the load weight limit of metal studs depends on a number of factors, including the height of the studs, the width of the studs and spacing. The axial load of metal studs refers to the amount of weight, or pressure, that the studs are able to withstand from both the top and the sides. This means that walls, in order to keep from twisting or bending in a severe wind event, must be able to bear the weight of both the structure above and the pressure exerted on them by the force of the wind at the same time. The axial load, or load weight limit, for metal studs varies widely. An 8-foot, 3-1/2-inch metal stud, for instance, may support over 2,000 pounds, while a 16-foot stud of the same width will support as little as 400 pounds. Although multiple factors do come into play related to the load weight limit for metal studs, as the length of studs increase, the less weight they support. Because of this, taller studs may need to be spaced more closely to offer the same stability to a structure. Like the size of the studs, the spacing of metal studs has a major impact on the amount of support that the studs provide. For example, 16-foot, 3-1/2-inch metal studs spaced every 16 feet inside a wall provide nearly twice the support as the same size studs spaced every 24 feet within the wall. Spacing has less effect on shorter studs, such as 8-foot ones, which maintain the same amount of support whether spaced at 12 or 24 inches. In many instances, the manufacturer of metal wall studs provides a chart or guide that indicates what the more-effective spacing for studs of differing heights is. When these charts indicate that closer spacing of the studs provides more stability than spacing studs further apart, you should space the studs as close as possible. On the other hand, if the chart indicates no major difference in the spacing of metal studs, you can save money by spacing studs farther apart. What Type of Music Helps a Plant Grow Faster? What Is the Typical Concrete Basement Wall Thickness?